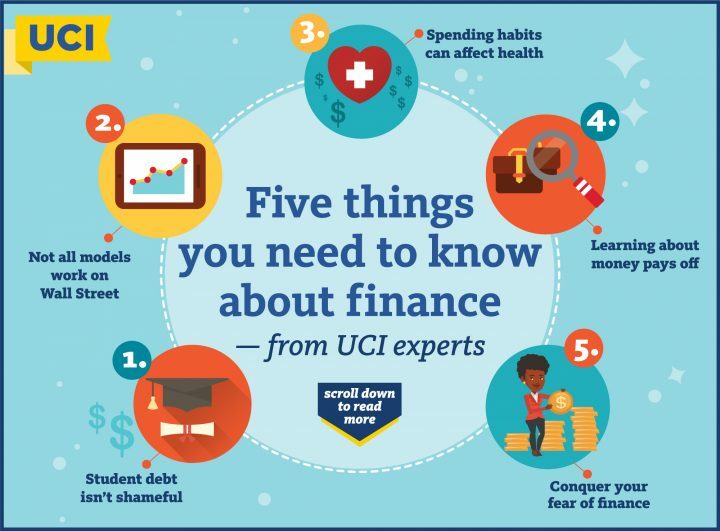 UCI experts share five tips on smarter ways to spend, save, invest and manage money. For students, debt is a defining feature of economic life today, according to Annie McClanahan. No stranger to debt herself – having accrued $90,000 of it while earning her B.A., M.A. and Ph.D. – the assistant professor of English has written a book, Dead Pledges: Debt, Crisis and Twenty-First-Century Culture (Stanford University Press, 2016), that explores how American society has responded to the financial collapse of 2008. Her advice is that students get as much information as possible before taking on debt, including investigating all sources of funding, such as grants, scholarships and federal student loans. Government loans offer more flexible terms, advantageous interest rates, income-based payment schedules and deferral options than do private loans. Critics often blame defective financial models for the economic crisis that started in 2007. In his book The Physics of Wall Street: A Brief History of Predicting the Unpredictable (Houghton Mifflin Harcourt, 2013), James Weatherall, professor of logic & philosophy of science, argues against this. The real culprits, he says, were the financial analysts who failed to think like physicists and didn’t understand the limitations of their models, resulting in a catastrophic misuse of science. “Delayed gratification is good for your health, both physically and financially,” says associate professor of economics Matthew Harding. “The ability to delay immediate gratification is associated with less frequent consumption of fast food.” Away-from-home eating – fast food in particular – is a contributing factor in America’s obesity epidemic. Harding collaborated on a lifestyle behavior studythat measured “time preferences.” Participants were asked if they would rather receive $10 right away or wait 30 days for a larger sum: $12, $15 or $18. The findings revealed that those who most often chose the delayed cash were 26 percent less likely to consume fast food. “A person’s willingness to wait for a larger amount of money was significantly associated with less frequent fast-food consumption,” Harding says. “Our ability to delay gratification may explain why some individuals find it easier than others to resist the temptation to consume fast food.” Behavioral economics, which studies the effects of psychology on economic decisions, can provide insights into human decision-making that can lead to innovative approaches in designing effective public health programs and interventions. Technology is at the forefront of personal finance, powering products and services from consumer payments and money transfers to wealth management and portfolio planning. These data-driven digital asset transactions are changing the nature of the relationship between consumers and financial institutions, affecting customer service and organic business growth opportunities as well as regulatory and legal issues. Online options let banks, brokerages, credit unions, mortgage lenders, financial planners and money managers offer customers a totally standalone digital experience or one supplemented by personal advisers. “People may not realize how much data is shaping our daily lives,” says Bill Maurer, dean of the School of Social Sciences and director of UCI’s Institute for Money, Technology & Financial Inclusion. “The collection, transmission and storage of information via devices ranging from mobile phones to ‘smart’ sneakers is a type of human/technology interface increasingly mediated by algorithmic processes that have as-yet-undetermined relationships to law. We’re already seeing their impact on financial products and decision-making too, through new non-bank lending services and alternative credit scoring.” With a grant from the National Science Foundation, Maurer is developing a summer institute enabling the next generation of scholars to study the ways in which technology and biases in algorithms, data analytics and mobile computing can create unintended outcomes and have potential legal consequences. Andrew Policano wants students to understand that financial literacy doesn’t mean they have to be an accountant, stockbroker or business executive. “We want you to major in your passion, but we want you to be able to achieve financial wellness in your life, whether you make $30,000 or $300,000 a year,” he says. “Helping young people reach that goal can be as simple as a few mouse clicks and a few hours of analysis that can prevent them from making a disastrous financial decision.” I’m The Dean’s Leadership Circle Endowed Professor of economics and public policy and academic director of UCI’s Center for Investment & Wealth Management encourages students to take advantage of the free Schwab MoneyWise on Campusprogram. It offers two six-module levels. The first teaches underclassmen best practices for managing money while in school, and the second helps prepare upperclassmen for financial independence after graduation. Each level takes about an hour to complete. Users can stop at any time and resume where they left off.